In Twelfth Night Shakespeare had Malvolio say: “Some people are born great, some achieve greatness, some have greatness thrust upon them.” I don’t think it is too difficult to work out under which group the sunbirds fall. 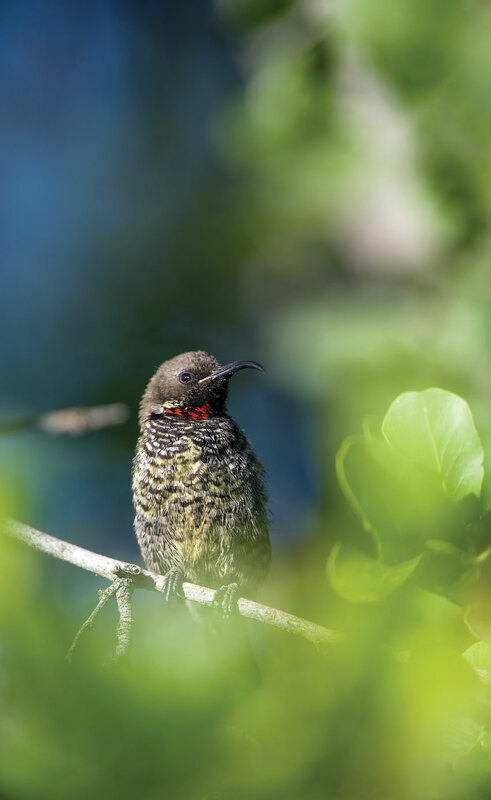 Namibia’s sunbirds have a tendency to prefer being born great in the northern part of our country, to be more specific, in the Zambezi Region. Ten species of sunbirds occur in Namibia, of which the Scarlet-chested (Chalcomitra senegalensis), Marico (Cinnyris mariquensis) and Dusky Sunbird (Cinnyris fuscus) occur in the central and northern parts of the country. The Malachite (Nectarina famosa) and Southern Double-collared (Cinnyris chalybeus) reaches its most northern distribution around the Orange River in the south. The northern group include the Amethyst (Chalcomitra amethystina), Collared (Hedydipna collaris), White-bellied (Cinnyris talatala), Shelley’s (Cinnyris shelleyi) and Purple-banded Sunbird (Cinnyris bifasciatus). Being a Windhoek resident means my scope of expertise on the sugarmen are limited to the Scarlet-chested, Marico and Dusky Sunbirds. Obviously I am a bit biased as far as preferences are concerned, but looking at their exquisite colours, you can’t really disagree that these are probably the best-looking of the whole bunch, excluding the Dusky, the only sunbird that can survive in the desert, which makes it rather special in itself. My extended and intimate knowledge of sunbirds is limited to these three species. Watching them for hours from the comfort of my back yard, I have experienced endless hours of pleasure. The weeping boer-bean (Schotia brachypetala) producing its voluptuous red juice-dripping flowers during spring is the venue. The competition from the Wattled Starling (Creatophora cinerea), Southern Masked Weavers (Ploceus velatus), Grey Go-away-birds (Corythaixoides concolor) and African Red-eyed Bulbul (Pycnonotus nigricans), is quite relentless, although the sunbirds’ long, curved bill, and elongated tongue do give them an unfair advantage over their opposition, because they can reach right into the inner soul of these flowers. The end of the bill is serrated near the tip to saw open the corolla to reach the nectar. Autumn produces its own magic, with the Windhoek aloe (Aloe littoralis) in full bloom. Unfortunately my Go-away birds have a knack for biting off the stem of my only Windhoek aloe, probably in frustration for not being able to reach the inner essence of the flower’s nectar. As a result, there are no other delicacies for the sweet-toothed sunbirds for the rest of autumn. 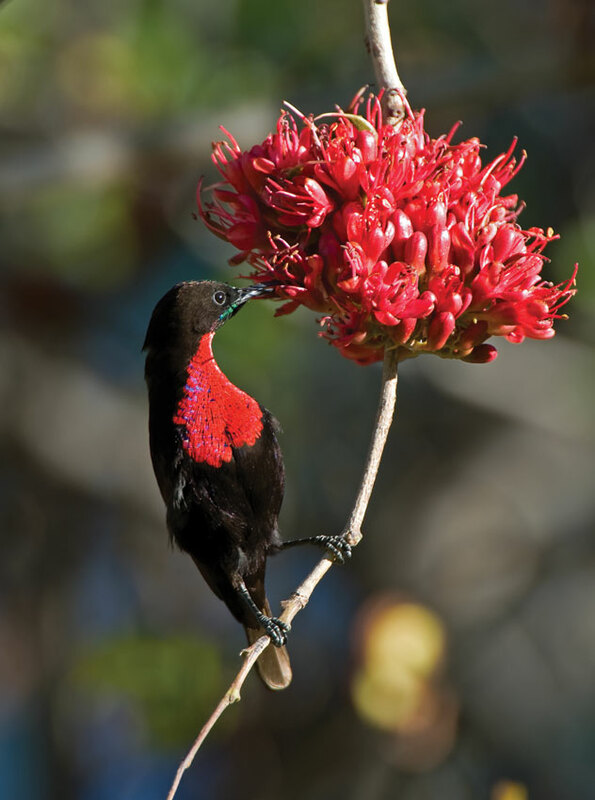 One of the sunbirds’ favourite pastimes is to beautify themselves. Most other birds prefer the water feature or small pools of water to perfom this act of hygiene. The sunbirds find this act rather passé and probably also a bit dangerous. They prefer the sprinkler, which in turn wets the tree leaves on the lawn. Waiting in the tree, the sunbirds then rub themselves against the leaves of the tree. Whether this gets them really clean, as in deep-down Omo-clean, I have my doubts, but in the end they seem to look quite fancy, although the process looks rather superficial to me. My mum should have had a look at this, because she always thought our bathing activities were not that effective and also somewhat superficial. 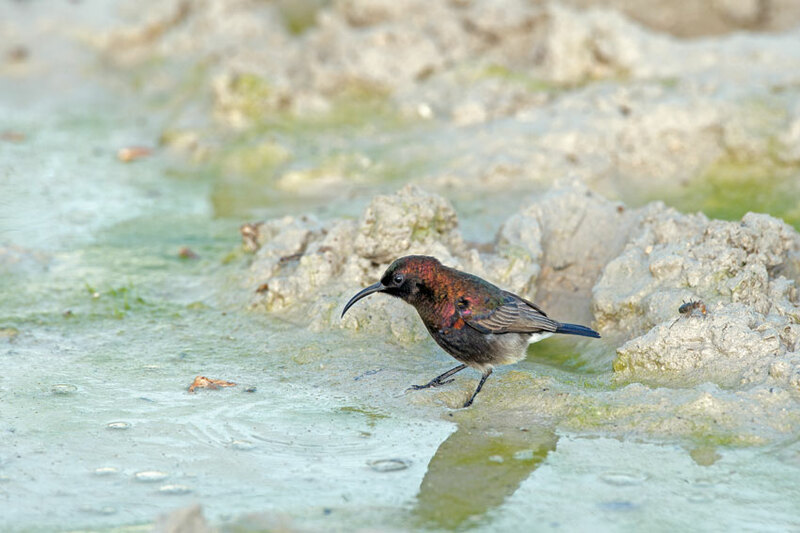 Another fascinating act of the sunbirds is their hunting of small insects in flight, which confirms the suspicion that their ancestors might be from Gobabis. In Etosha there are a few additions to the above-mentioned three sunbirds. The White-bellied Sunbirds prefer a habitat that is dry acacia and other woodland, so the area is ideal for them. The Aloe hereroensis in front of the gas station in Okaukuejo is the place to go if you want to catch them in action. Obviously, this is during autumn when they are in flower. Although Amethyst Sunbirds should occur here, I have never seen them in Etosha. They prefer open woodland, and according to Roberts Bird Guide, gardens, although the garden habitat is not that satisfying in these areas. Further north to the Kunene Region and to the east they are quite common. 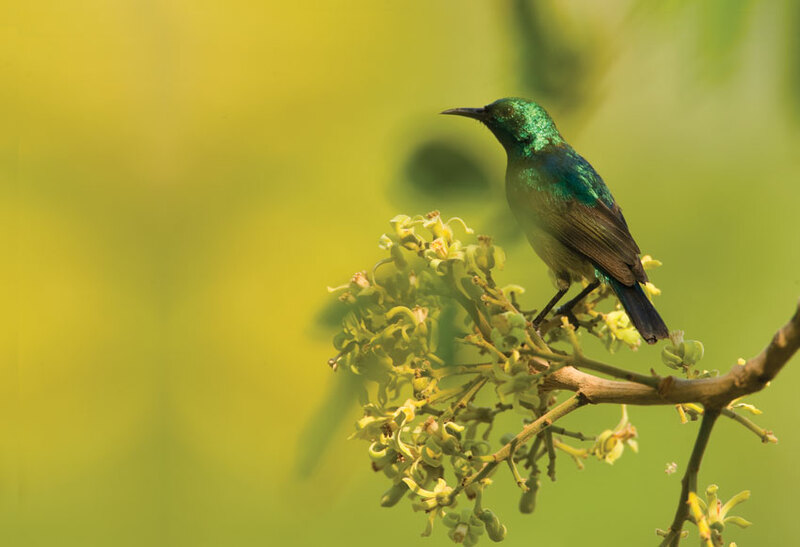 The Zambezi Strip, as always, adds to the above-mentioned sunbirds the Collared and Purple-banded Sunbirds, providing them with a habitat of mangroves and evergreen forests that supplies a different brand of insect and nectar. Kalizo Lodge, apart from being the area to host the largest Southern Carmine Bee-eater (Merops nubicoides) colony in Southern Africa, also lays claim to having a resident pair of Shelley’s Sunbirds. After many hours of watching, sitting, sleeping, waiting and carrying my camera around with my neck muscles in a constant spasm, looking up into the different trees for this elusive sugarman, I have yet to see it. It’s not that I don’t believe Val (you never doubt anything she says), it’s just I still have to see this little fellow. 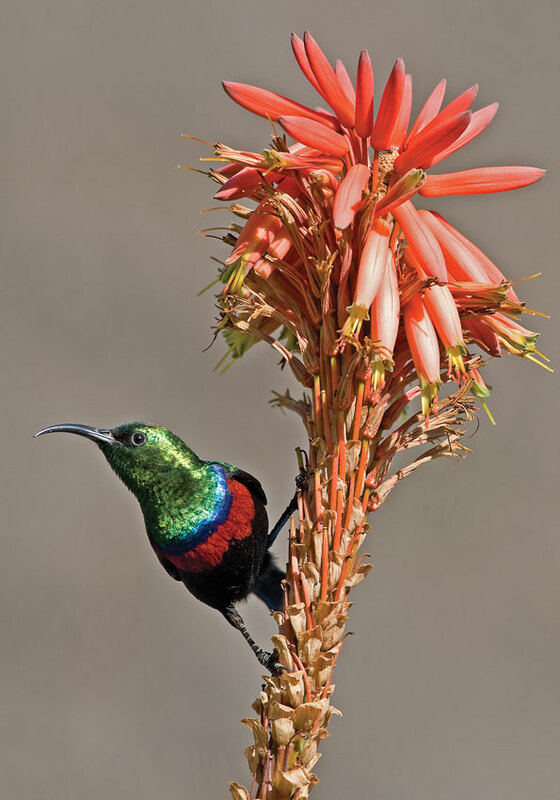 To the south, along the Orange River – the border between Namibia and the Republic of South Africa – you will find (again, if you are lucky) the brilliant, bright metallic-green Malachite Sunbird and the Southern Double-collared Sunbird. Although their preferable habitat is fynbos and Karoo shrubland, they do occur in gardens in these areas. I must confess it would probably be much easier to fly down to Cape Town and look for them there. This is if you are prepared to deal with a few muggings or hijackings along the way, and being harassed by Western Province supporters in the process. As far as their musical talents are concerned, they are rather average, because the best they can offer are high-pitched, penetrating monotonous calls that have a rather metallic-like sound, and I don’t mean metallic as in Metallica. When looking at their bills, you can probably not expect much more. Do they play any part in pollinating plants? Contrary to popular belief, most birds are not very good pollinators. The sunbirds, however, are an exception. They are generally considered to be the best. Their only other anatomical claim to fame apart from having short legs is their very strong feet on which they perch when feeding. 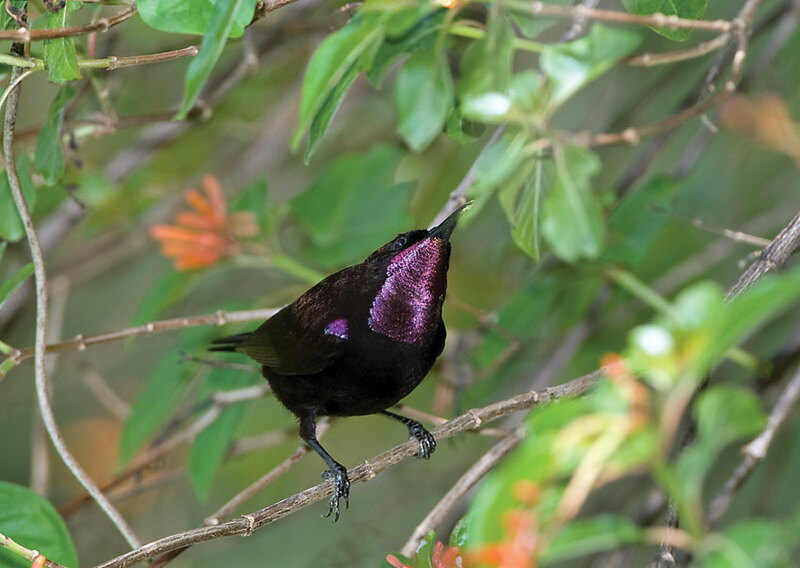 The million-dollar question is: are our sunbirds related to hummingbirds? Apparently not. Although both have long, curved bills and both consume high-energy nectar, only hummingbirds have truly mastered the art of hovering in stationary flight, even backward flight. On our trip to Argentina we were fortunate to see a hummingbird, and after I saw it in flight, I understood what was meant by the term hovering. Because of this ability to hover, the hummingbirds require a great deal of high-energy nectar. Whatever your opinion on the pros and cons of hovering, it’s worthwhile going to find a hummingbird, albeit not in Namibia. You will need to travel further afield to witness this wonderful act of aviation. As for Sugarman and not Sugarwoman, it’s not too difficult to figure this one out. Sunbird females are, to say the least, somewhat drab, as in dull greyish. The suits the males are born in just look so much better. Dr Pompies Burger,this is his passion.Thank you ,SIR. How do they balance themselves whilst drinking. I suspect that they can actually see the flowers from above and they tend to come to the places where they saw and eat from the aloes from the previous season. They drink from open water standing.